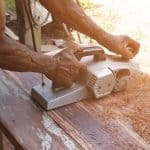 The biscuit joiner is a vital tool in any woodworker’s armoury. 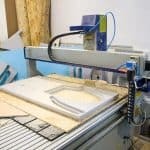 Revolutionizing the way we can go about creating complex joints for our projects, once you become au fait with using your biscuit joiner there is no end to the speed and efficiency with which you can work. However, even a seasoned pro may not know all the tips and tricks of what the humble joiner can do. 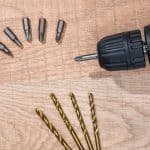 For that reason, we have put together this top 10 cheat sheet to get the most out of your biscuit joiner, no matter your skill level. First off, let’s talk about biscuit sizes and what you should own. Whether you’re a professional tradesman, or an at home hobbyist, you should always have a selection of all the three main biscuit sizes in stock. As long as you have several spare 0, 10 and 20’s in your tool box, you won’t get caught short in the middle of a job. Furthermore, you should keep your biscuits sealed in airtight containers. 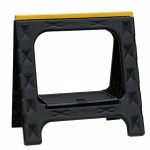 This will obviously help keep them clean, but it will also prevent any damp setting in that could cause them to swell. A well-tuned biscuit joiner should give you flush fitting joints without too much issue. It’s what the tool is designed to do afterall. However, if you find your joints not sitting as well as they should, there is a quick trick you can pull. Elevate the biscuit joiner with a sheet of sandpaper. If you do this before cutting the face-grain slot, you can then use your router (after you have fixed the joint together) to flush trim the end so that you achieve a wonderful flush line finish. For repeat work where you want to set the fence at the correct height each time, there’s a handy little too you can make for yourself. Simply use small blocks with slots at specific height settings. Have these marked in line with what you need and you will be able to quickly set the height each time. A few biscuit-joiner fences have the ability to tilt to 135 degrees. This helps the tool capture the end of a mitered workpiece, so that you have more stability when making the cut. However, joiners with a fence that can only tilt to 90 degrees will not give you that option. If that describes your tool there is a way around it; just clamp your mating mitered workpieces back-to-back. The bevels will form a 90 degree angle and you will be able to cut slots on each miter. Sorry to state the obvious but this clearly needs to be part of a top 10 that lists ways to get the most of your biscuit joiner. 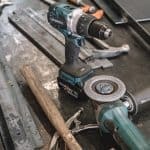 Just as with any other power tool, you will get the best results if your tool is in tip top condition, (which starts with keeping it clean), and your blades are looked after. A dirty blade will heat up faster because of all the residue covering the surface. You should also avoid machining slots where PVA glue has been used as this will coat the blade and will cause problems later. On the subject of glue, let’s take a look at what you should be using. It is important that you keep your glue in doors so the temperature is regulated. You can also use an aliphatic compound glue. This is less viscous than the water based glues and will actually set quicker in colder conditions. When gluing two surfaces face to face the glue can be a real pain. We’ve all been there, the sides slip around like drunks on an ice-rink. If trying to align them really does cause problems, try using several biscuit slots near one edge, to make the job quick and precise. Believe it or not, but the most accurate way to use the jointer in static mode on a flat surface. This is counter-intuitive as many people think that freehand work with a fence will give you the best results. If you use a proper reference board as the machine baseplate you will be able to keep in static mode and still fine tune those measurements. Another tip for when you find yourself doing repeat jobs, (for instance shelves in a book case). A T-square will give you repeatable accuracy. 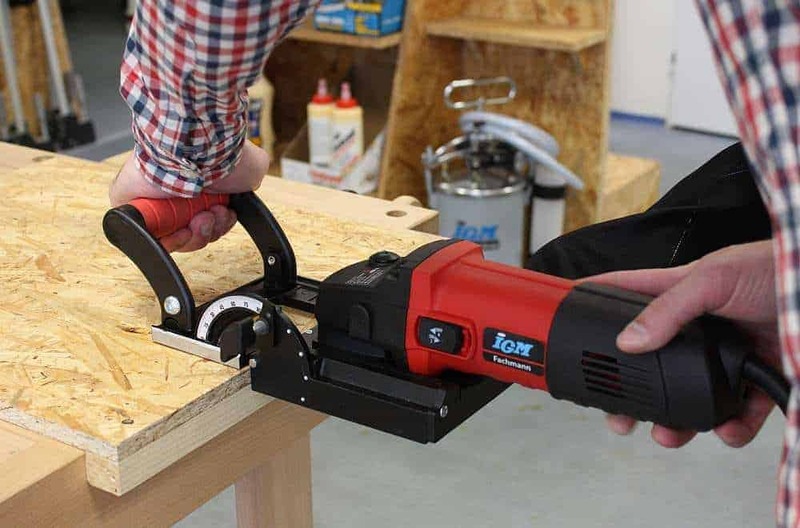 By using the T-square to line up your biscuit joiner for cutting slots in the case sides and mating shelves, you will enjoy the same results time and time again. A dull blade will not give you the best results. If there’s tear-out or hanging strands after you have finished a cut, you know you have problems. It is quickly remedied however, just make sure you have a spare blade close by. The refit is a 3-minute job and you can go back to getting the finish of a pro.